Did you know The Fourth will be six years old on June 4? 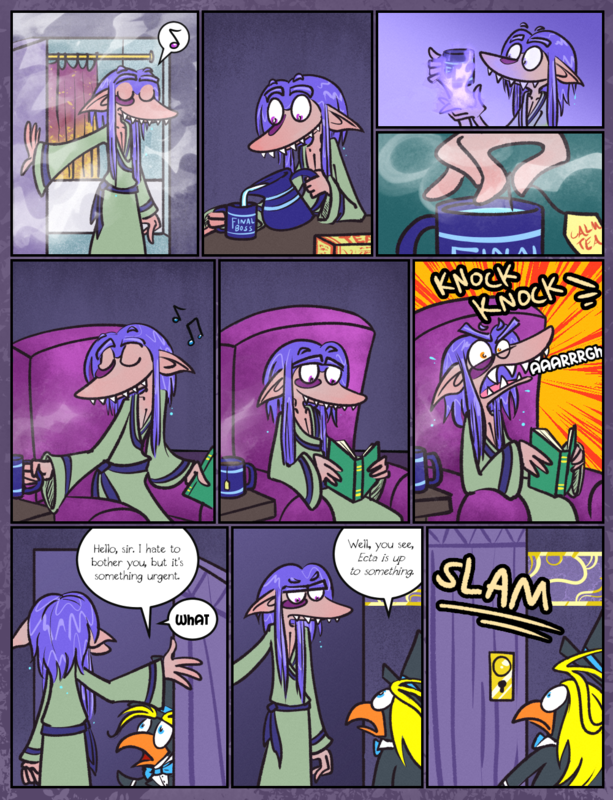 Frozio will soon to learn that Skarva will not give two *bleep* in a hat what Ecta is doing, especially doing relax time, speaking of I like that he’s a tea drinker, tea drinkers ftw! To be fair, he’s a (black) coffee guy every morning. Just like Victor. But he likes his tea after a long day! Ecta is always up to something, and it’s always to Skarva’s benefit. Go away. Poor Frozio. This wasn’t in the new-employee orientation. More like Ecta is always up to something, it’s always annoying, and I hired YOU to handle it so I don’t have to deal with the annoyance. This happens to me way too often…just minus the penguin. I’d probably take it better if a penguin were the one interrupting me! I love how he heats up his tea, that’s too cute. Same. But the penguin is Shadow. And instead of knocking, it’s jumping onto the arm of the couch and trying to put his face on my keyboard. And YES, Ecta is up to something. Ecta is Always up to something. Too bad for Frozio Skärva hadn’t started sipping the Calm Tea yet. That calm tea is about to turn into some orange (fury) juice. If you make that Final Boss mug a real thing and sell it in some kinda store I’d buy it. … also when is that bruise on Skarva’s right eye gonna heal already! Jesus! That said I am EXACTLY like this. I get FURIOUSLY PISSED when someone interrupts my R&R (I won’t always vocalize it but still!). Literally never! Not even Lorelei can do it! Poor guy can’t get a break.